These vegan brownies are best paired with wine, good friends, and gossip. Baking for a get-together with my girlfriends can be a welcome challenge at times that really gets me out of my ingredient comfort zone. We have conflicting allergies -- no dairy for an intolerance and an allergy, and no dairy substitutes like margarine or shortening because of my allergies. and no nuts! 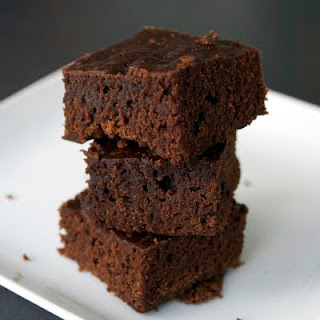 -- but we persevere, and every now and then stumble upon some great favourites, like Olive Oil Chocolate Chip Cookies and now these Vegan Brownies. Even though they lack my favourite ingredient ever (butter) they have plenty of my other favourite ingredient ever (chocolate), and the oil makes them rich and delicious. Perfect for your next party, family reunion, or quiet night alone at home. Preheat oven to 350F and grease a 13x9 pan. Mix dry ingredients (flour, sugar, salt, cocoa, baking powder) in a large bowl. Make them sit there a minute and think about what they've done while you mix together the wet ingredients (water, oil, vanilla) in a smaller, separate, bowl. Mix the wet into the dry until well blended. Spread mixture in the pan, and bake for 25 minutes, or until a knife can be inserted and come out clean, or a toothpick comes out with moist crumbs.